When are non-zero return thresholds a good idea for OS performance classification? IS/OS variable correlations: What about changes for lower/higher Sharpe Ratio values? IS/OS variable correlations: How do things change for higher/lower in-sample PF values? Is our random forest model for OOS predictions improving with time? A Bayesian look. Our Reinforcement Learning mining and repository: Now live trading! Swap Arbitrage in Forex trading: Can you avoid market risk by using swap-free accounts? A practical way to learn how to code: Just code fight! Reinforcement learning in trading: What about random data? Is a symbol that is more traded always more efficient? How long does it take to see in-sample/out-of-sample variable correlations? Is there anything in live trading we can predict from in-sample data? Machine learning in trading: Go simple or complex? Why do historically top performing trading systems almost always under perform? A market truth: What leads to persistent real edges? Is the key to more effective diversification the Risk to Reward ratio? The Omega ratio: A much better performance metric than the Sharpe? Historical volatility in the GBP: What can we expect from a Brexit? What is a trading system parameter? Not every possible thing that can be changed! Are Forex trading hours correlated with return directionality? Symmetry in Forex trading systems: Should strategies be symmetric? Our Forex machine learning system repository is alive again! Do Monte Carlo simulations say anything about system robustness? Are multiple pair strategies better than single pair strategies? Using OpenKantu in practice: How much do systems deteriorate in a Pseudo out of sample period? Do Monte Carlo worst case scenarios apply to portfolios? Using qqpat: When should you expect to see long term statistics? The myfxbook great long term accounts: Why do they never last? Financial Time Series: Can you generate new valid data? Financial time series: What is a market condition? Can fractal dimensions predict system abundance in Forex pairs? Trading Basics: Is it worth it to make money you cannot keep? Using R in trading: Is the fractal dimension constant in financial timeseries? Rethinking machine learning in trading: Let's mine using the GPU! After more than one year of trading: Are there any in-sample/out-of-sample correlations? New Algorithmic Trading Timeframes: Just shift it! Machine Learning in Trading: What about lower timeframes? Oanda's not-so-good 1M data: Can you trust your own broker's historical data? Using OpenKantu in Practice: Is old Forex data irrelevant in today's market? Portfolio Optimization: What is the best way to calculate trading system weights? Data mining bias, a mathematical look. Part 2. Data mining bias, a mathematical look. Part 1. How far should we go into the past for Forex simulations: Is old data really useless? Does automatic trading system generation in Forex really work? Some live trading evidence. Moving From Metatrader to Oanda: Goodbye forever Metaquotes! Data-mining in Algorithmic Trading: Determining your data-mining bias through the use of random data. Part two. Data-mining in Algorithmic Trading: Determining your data-mining bias through the use of random data. Part one. 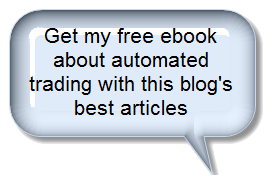 An Open Letter To Metaquotes: Why 2013 is the last year I plan to use your software. Autonomous Forex Trading Agents Using Machine Learning: The Road to True "Set-and-Forget" Algo Trading? The Relevance of Back-testing Time: Does a longer, profitable back-test lead to better OS success probabilities? Answering a Basic Question: What do systems with profitable out of sample results have in common? Neural Networks in Trading: You Need to Look at the Picture, Literally! An NFA Compliant MT4 Virtual Order Manager, Finally! Trading System Walk Forward Analysis: Are you sure you're adapting? The Draw Down Potential Behind High Trading Frequency: Much More to Consider Than Simply Statistical Significance! Going Deeper Into Forex Simulations: So You Think You Can Ignore Swap Rates? Think Again! Big and Small Money: Does the Little Guy Have an Advantage? High Vs Low Reward to Risk: Is One Approach Better Than the Other? Discretionary Vs Algorithmic Trading: Is One Better Than the Other? No! Neural Networks in Trading: Why One Pair and Not Another? Evaluating/Simulating Broker Dependency: What Changes in a System from Broker to Broker? Measuring System Quality: Should We Only Use Monte Carlo Criteria? They Say 90-95% of Retail Traders Lose All Their Money: Any Evidence ? Indicators Vs Price Action: Is One Better Than the Other ? Solutions to Broker Dependency: Would Trading Only One Feed Work ? Forex Binary Options: Are They Any Better Than Spot Forex? Historical Max Draw Down Abundance in Monte Carlo Simulations: An Excellent System Quality Indicator? Walking Forward: Do Asirikuy Systems Yield Profit With Continuous Optimizations ? Analyzing Hypothetical Cases: And What If There Was No Euro ? Universal Forex Inefficiencies: Only a Long Term Trend Following Phenomena? Low Liquidity Pairs : Is Trading Them Worth the Hassle? Reducing Broker Dependency: Is Dithering the Answer ? Comparing Your System's Profitability Against Random Outcomes : An Edge or Just Luck ? The Stop Loss in Forex Trading : Use It or Avoid It ? Evaluating System Distributions : How Many Trades are Enough Trades ? Mechanical Forex Crossword Puzzles : Happy New Year! Ready to Win Your 20 USD? Mechanical Forex Crossword Puzzles : The Markets and Christmas, Are You Up to the Challenge ? Holiday Trading : To Trade or Not to Trade ? Mechanical Forex Crossword Puzzles : Canada, Coffee and Lincoln, Ready to Win Your 20 USD ? Trading the Forex Minor Pairs : Is It Worth the hassle ? Mechanical Forex Crossword Puzzles : Week No.2, Now With Prize Included ! Inefficiencies in Trading : Are There Local and Global Inefficiencies ? Running From the CFTC : Which Non-NFA Brokers can US Citizens Use Now ? Ending a Myth : Are All Trend-Following Systems Long Term Strategies With Many Losses and Few Profitable Trades ? Destroying a Myth : Indicators Lag… Actually, they don’t. Gaps in Forex : Do They Lead to Any Tradable Ineffieciency NOT related with “gap closing” ? Confused by Your Charts ? How About Trying a Simple Line Chart for Trading ? Why are Five Years Statistically Significant for the Evaluation of Trading Systems ? The September Effect : The Ghost Around the Corner ? Three Way (Triangular) Arbitrage in Forex : Does it Work ? To Look or Not to Look ? : Setting and Forgetting in Automated Trading. Volume Based Forex Systems. Can it be Done ? Broker Conspiracy Theories : Are they True ? The Greatest Advantage of Automated Trading, at Least for Me ! The Animal Kingdom of Traders : Where are you in the Food Chain ? The Reality is, Most People are Terrible Losers… Are you a Good or a Bad Loser ? Judging by the Amount of Trades. Does it Really Matter ? Intelligent Trading : Answering Every "What if"
Fxreviews Facebook Group : Feel Free to Join ! My Currency Trader Magazine June Article, Check it Out ! Are there any Bad Market Conditions in Forex Trading ? From Beginner to Successful Trader : How Long Does it Take ? Strategy Diversification – Higher Profits… Higher Risks ? Reversing Strategies… It Almost Never Works ! Support and Resistance, Predictable A Priori ? Volume in Forex… Does it Mean Anything ? Dollar Cost Averaging in Forex Trading… Is this a Sound Approach ? Broker Dependency in Forex Trading… How Big is this Problem ? Curve Fitting Trading Systems… Can it be Avoided ? Why Megadroid will Likely Wipe Your Account… I am NOT Kidding. It's Simple, Either You're Honest or You're NOT ! Avoiding the Forex Burnout… Staying on the Game ! Indicators or No Indicators, What is Better ? Uploading Files to a VPS… A Simple How To. The Road To Financial Freedom… Part No.2…Is this Right for You ? The Testing Time Problem… For How Long Should I Demo Test ? The Road to Financial Freedom Series… Part 1. What is Financial Freedom After All ? The Forex Robot World Cup... Don't Fall for This !! Trading Gaps in Forex... Is there even an Inefficiency Present ? Trading like a Couple, Correlation in Trading. Forex Trading... Is this really for you ? Video Webinars Now Available to Newsletter Subscribers ! Cutting the Costs of Trading... Virtual Private Sharing ? Stopping Your Loses in Trading... Why you Need a Trading Journal. And you say you have a strategy ? Can Anyone Trade the Forex Market ? We'll see ! Why Does Everyone Want a Scalping Strategy ? Can You Trade Automated Trading Systems Successfully ? Money Management. The most important, most neglected aspect of automated trading. Can Ranging Markets be Exploited with an EA ? You don't have anything to lose... What a fallacy ! The indicator series… Going back to the basics ! Backtesting and getting it right ! How to correctly backtest an MT4 expert advisor. The Simple Daily System : Profitable or Deadly Trap ? What would you like to know about automated trading ? Commercial Experts, Stealing from the Free Zone ? The God’s Gift ATR, Turning a Good EA into a bad one ! Trading more or trading less ? So... What is your edge in forex trading ? Testing Every Expert Advisor, The WRONG Strategy ! Living From Automated Trading System - How Much Money do you Need ? My Turtle Trading EA - First Profitable Results ! Tick Volume Charts, The Story They Never Told You ! God’s Gift, the Best Forex Expert Advisor Now Better ! Profitable Expert Adviors are Unmarketable ? Forex Expert Advisors, Does the Winning Percentage Say Anything ? Forex Automated Trading EA Championship, Worth the Trouble ? Free Expert Advisor, the way to go ! Expert Advisors : Is your ea Broker Sensitive ? The Investor Access, What you SHOULD ask for ! Trading Forex, It's all about the Exits ! Forex automated trading : Why you need a VPS ! Scalping Expert Advisors, why most are not working anymore ! Why 95% of forex traders fail and you are one of them ! Viseu Open 001, One Month, Up in Profit ! Fxclearing.ca Review , Best Broker, Enough Said ! Ebook to be realeased soon ! God's Gift EA, 2 months, finally ... A loss ! Free Expert Advisor Portfolio, Week 8, Up and Running ! God's Gift Expert Advisor, Week 2, First Trade ! New Chat on the Blog ! Metatrader 4 Backtesting, Reliable or Not ? Free Expert Advisor Portfolio 2, Week 6, Slow and Steady ! Doubleplay Live Trading Stopped ! Pointbreak, Week 3, Ranging Market, Ouch ! Pointbreak, Week 2, Action ! Free Expert Advisor Portfolio 2, Week 4, Profits are In ! Pointbreak, Week 1, I like what I see ! Free Expert Advisor Portfolio 1, Week 3, BACK ON TRACK ! Free Expert Advisor Portfolio 1 , Week 2, OUCH ! Forex Expert Advisors. Do they work ?